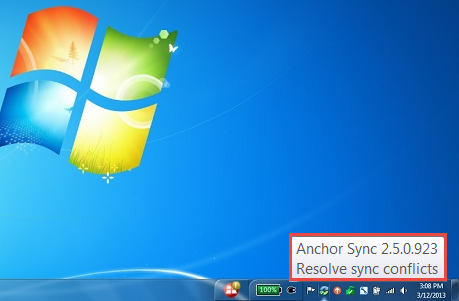 To prevent possible performance and sync issues, we recommend that end users utilize the latest version of the Anchor desktop client. By default, the Autoupdate tool, which is installed as part of the Anchor desktop client installation package, will check and install updates on a regular basis. In some instances, however, desktop clients might not update as expected. As an administrator, you can use the Machines tab to find desktop clients that are out-of-date. Log into the administrative web portal. In the left-hand organization navigation menu, select the appropriate organization. Click the Machines tab. The Machines tab displays, listing all existing machines currently registered in the system. Click the Needs Update button to filter and view all desktop clients that need updated. Alternatively, end users can find their current desktop client version listed in their local machine. On the end user's local machine, hover over the system tray icon. The current desktop client version will display in the notification pop-up bubble. Alternatively, in the Microsoft Windows Programs and Features tool, you will see the latest desktop client version in the list of programs. On the affected user's local machine, navigate to the desktop client installation directory (by default, the installation directory is located at C:\Program Files (x86)\Synced Tool\bin). If you experience issues, please contact Axcient Support at http://www.efolder.net/support/.